Spring weather challenges require modifications to application management. Del Unger's biggest concern with this year's corn crop is the timing. Because it was planted in a 12-day window, "We're either really, really right, or really, really wrong this year," says Unger, who with his son, Lance, farms near Carlisle, Indiana. They're not in a narrow timing window by choice. They like to start planting corn and soybeans the end of March and first part of April and finishing by early May. It's a schedule that sees most of the corn pollinating before the hottest part of summer. Early planting didn't happen this spring due to cold conditions. It even included a late-spring snow. Then Mother Nature flipped the switch. "We went right from one of the coolest Aprils I'd ever seen to a dry, hot May," says Del. The dry conditions were welcomed at first. "When we got running we had all three planters–two planting corn and one soybeans–running at the same time, and it never rained us out," says Del. "We just went out every day and planted. We couldn't have planted in better conditions." But then dry turned into very dry. "We went 5 or 6 weeks with less than a quarter-inch of rain," recalls Lance. The dry conditions started taking its toll in ways the Ungers had never seen. For example, despite waiting the recommended time to plant corn after applying anhydrous, the Ungers had corn damaged from ammonia burn and ended up replanting 160 acres. "We know the ammonia burn was due to the dry spring, but our problem this spring have us thinking about switching to an all-liquid nitrogen program for next year," says Lance. The Ungers also had some root burn from starter fertilizer. But they saw less of that problem where they applied starter 2 x 2 x 2 (placing fertilizer on both sides of each corn row 2 inches to the side of the row and 2 inches down) than where they applied starter 2 x 2 (dropping fertilizer 2 x 2 only on one side of the corn row). They applied the same amount of starter in both applications, but in the 2 x 2 x 2 half, the starter was placed on each side of the row while in 2 x 2 all was placed on one side of the row. Their starter application included 5 gallons per acre 28 percent urea ammonium nitrate, 5 gallons per acre 10-34-0, 2 gallons per acre ammonium thiosulfate (ATS), with a quart/acre of zinc. The Ungers faced another issue on their irrigated acres, resulting in added costs. "By early June we'd already applied a third, and maybe a half, of the water we normally apply in a whole year," says Del. The Ungers are collaborating with Melanie Burk, area BASF Innovation Specialist, on trials comparing three different post-emergence sulfur applications on soybeans. Those applications are: (1) ammonium sulfate (AMS) + potash, (2) AMS + K-Mag (potassium fertilizer that also contains magnesium and sulfur), and (3) K-Mag + potash. "We are looking to see which application has the greatest results, especially in terms of sulfur application," says Burk. "Several research articles are touting the benefits of added sulfur. We want to confirm the application and products that will provide the best results in Ungers' clay soils and sandy soils." Despite the unusual spring weather, the good news is the Ungers have excellent stands. After receiving good late May and early June rains their crops look good. "We're going to be more susceptible this year to July heat," says Del, "but the crop we have in mid-June has the potential to be very good." "Corn plants have set several ears and are showing good Plant Health," adds Burk. 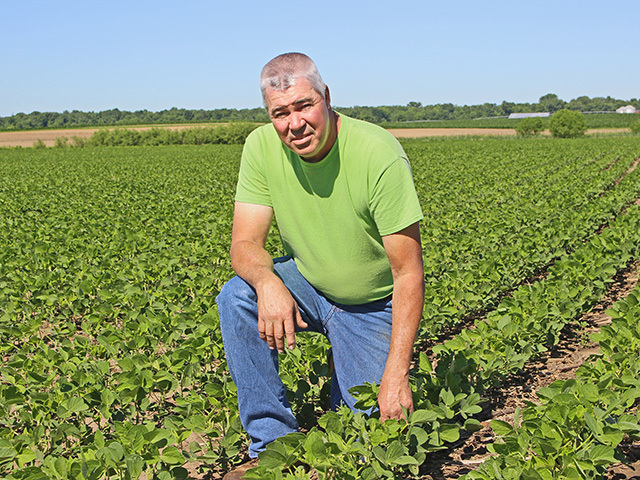 "If we get the right pollination conditions and another rain or two, Del and Lance will have an exceptional crop."